Jose and his wife Nina reside in Pearland, TX, with their daughter, Melanie Andrea...Signed by Houston as a 16-year-old non-drafted free agent out of Maracay, Venezuela...signed by Astros scouts Pablo Torrealba and Wolfgang Ramos on Sept. 27, 2006...Has six All-Star Game appearances under his belt (2012, 2014-18), including starts in 2015, 2016, 2017 and 2018...led the Majors in All-Star fan votes in 2018, becoming the first player in franchise history to do so...is the second player in franchise history to start four All-Star Games, joining Craig Biggio (1995-98)...In 2017 he became the second Houston Astros player ever to earn league MVP honors, joining 1994 NL MVP Jeff Bagwell....Was showered with awards during the 2017 offseason, which included the 2017 American League MVP award...also was named the Sports Illustrated Sportsperson of the Year (along with J.J. Watt), the AP Male Athlete of the Year and the Baseball America Player of the Year...IN THE COMMUNITY: Has been an ardent supporter of the Sunshine Kids, a foundation that benefits children with cancer...was named the Astros nominee for the Roberto Clemente Award in 2013 and 2017)...Earned the Astros MLBPAA Heart and Hustle Award in 2012 and 2014... Signed a four-year contract extension on July 13, 2013, that covered the 2013-17 seasons...the deal also included club options for the 2018 and 2019 seasons...had his 2018 option picked up on Nov. 6, 2017...Signed the largest contract in franchise history on March 19, 2018, a seven-year deal that will keep him in Houston through 2024. Put together his sixth-career All-Star season in what was his eighth season in the Major Leagues...played in 137 games, the second-lowest total of his career behind his debut 2011 season (57 games)...served his firstcareer stint on the Disabled List from July 26-Aug. 21 (right knee soreness)...prior to his DL placement, was leading the Majors in hits...among AL players on the year, ranked third in batting average (.316) and sixth in on-base percentage (.386)...led the Majors in road batting average with his .349 (94x269) mark...marked the thirdconsecutive season that he led the Majors in road batting...led the Majors in batting average in the 7th inningor-later with a .380 average (57x150), a franchise record for a single season (previously Lance Berkman, .371 in 2004)...ranked third among all Major League hitters in batting average vs. right-handed pitchers (.329, 128x392)... tied his single-game career-high for hits (4) four times during the season, giving him 28 career four-hit games, the second-most in franchise history behind Craig Biggio (34)...surpassed Jeff Bagwell (26) and Cesar Cedeño (25)... moved up the club all-time lists in runs scored (8th, 645), hits (7th, 1,419) and multi-hit games (6th, 403)...led the Major Leagues in All-Star fan votes, becoming the first player in franchise history to do so...was his sixth All-Star selection and his fourth-consecutive fan-elected start at second base...became the second player in franchise history to start four All-Star Games, joining Craig Biggio (1995-98)...made his seventh-career Opening Day roster, making his seventh Opening Day start at second base on March 29 at TEX...exited the game in the 4th inning on July 25 at COL with right knee discomfort...placed on the DL on July 28 (retroactive to July 26) with right knee soreness...activated from the DL on Aug. 21...posted the 25th four-hit game of his career on March 30 at TEX... played in his 1,000th career game on April 10 at MIN...recorded 1,272 career hits within his first 1,000 career games, the second-most by a foreign-born player in MLB history behind only Ichiro Suzuki and his 1,414 hits... only 25 players in MLB history recorded more hits within their first 1,000 games than Altuve, and 18 of the 25 are members of the Hall of Fame...recorded the 4,000th at-bat of his career on April 11 at MIN...played in his 500th career game at Minute Maid Park on April 27 vs. OAK...became the fourth player in franchise history to play 500 career games at Minute Maid Park, joining Brad Ausmus (501), Craig Biggio (590) and Lance Berkman (779)...fell a triple shy of the cycle on April 28 vs. OAK (4x5) in what was the 26th four-hit game of his career...posted 41 hits prior to May, the second-most in club history prior to May of a single season behind Derek Bell and his 45 hits in 1998...on May 6 at ARI, became the seventh player in club history to hit a triple on his birthday...logged his 1,000th career game at second base on May 22 vs. SF...became the third player in Astros history to play 1,000 games at the position, joining Craig Biggio (1,990) and Bill Doran (1,138)...fell a double shy of the cycle in a 4x4 game on May 26 at CLE...was his 27th career four-hit game, surpassing Jeff Bagwell (26) for second-most in franchise history... recorded his second-consecutive four-hit game on May 27 at CLE (the 28th of his career)...recorded a hit in 10 consecutive at-bats spanning three games (May 25-27), topping his previous franchise record of hits in eight straight at-bats that he set in 2017...became the first Major Leaguer to get a hit in 10 straight at-bats since Dustin Pedroia (11 straight AB's) in 2016 (Elias Sports Bureau)...posted the third multi-homer game of his career on June 20 vs. TB...combined for back-to-back-to-back home runs with George Springer and Alex Bregman on June 20 vs. TB (Springer-Bregman-Altuve)...was the sixth time in club history that the Astros hit three consecutive homers in an inning, and the first time since May 2, 2008 vs. MIL (Miguel Tejada-Lance Berkman-Carlos Lee)...recorded 129 hits prior to the All-Star Break, the second-most in franchise history for a single season and one shy of his club record of 130 set in 2014...hit safely in 22 consecutive starts at home from June 2-July 14, the longest streak by an Astro in Minute Maid Park history...was the second-longest home streak in franchise history, behind Rusty Staub's 25-game streak at the Astrodome in 1967...went 1x3 as the starting second baseman in the 2018 All-Star Game at Nationals Park...his single was his first-career hit in an All-Star Game...became the ninth second baseman in AL history to start four All-Star Games, joining Roberto Alomar (9), Rod Carew (8), Nellie Fox (8), Charlie Gehringer (6), Joe Gordon (5), Bobby Doerr (5), Robinson Cano (5) and Willie Randolph (4)...hit the 11th leadoff homer of his career on Sept. 11 at DET, and his first since May 5, 2016 vs. DET...became the fourth player in franchise history to hit 11 leadoff homers, joining Craig Biggio (53), George Springer (24) and Terry Puhl (13)...batted .265 (9x34) with two doubles, one homer and four RBI in eight postseason games...reached base in all eight games...started at second base in the Astros first five postseason games, before starting at DH in Games 3-5 of the ALCS...homered off Corey Kluber in Game 1 of the ALDS vs. CLE, going back-to-back with George Springer...was the fourth set of back-to-back home runs by the Astros in postseason history (first since Altuve and Carlos Correa in Game 2 of the 2017 World Series at LAD)...underwent successful surgery on his right knee on Oct. 19. Was an All-Star for the 5th time in his career in what was an MVP-caliber season...won the AL MVP, Hank Aaron Award, his fourth consecutive Silver Slugger, second consecutive Sporting News Player of the Year, Sports Illustrated Sportsperson of the Year, Esurance Best Major Leaguer and the MLB Player of the Year and the AL Most Outstanding Player at the Player Choice Awards for the second consecutive season...won his third career and second consecutive batting title as he led the AL with a career-high .346 batting average...led the Majors in batting average by 15 points, topping Charlie Blackmon (.331)...the last Major League player to post a batting average this high was Miguel Cabrera in his 2013 MVP season (.348)...joined Ty Cobb (11), Rod Carew (7), Ted Williams (6), Wade Boggs (5), Nap Lajoi (5), Miguel Cabrera (4), Harry Heilman (4), George Brett (3), Tony Oliva (3), Carl Yastrzemski (3) and Joe Mauer (3) as the only AL players ever to win three or more batting titles...also led the American League in hits (204)...became the first player in Major League history to be the outright leader in hits in his league in hits in four consecutive seasons...Ichiro Suzuki led the AL in hits from 2006-07 and 2009-10, but shared the lead in hits with Dustin Pedroia in 2008...this was his fourth career (and fourth consecutive) 200-hit season...prior to Altuve, only one player in club history had ever recorded 200 hits in a season, Craig Biggio in 1998 (210)...became the 11th player in MLB history to record 200 hits in four consecutive years, joining Ichiro Suzuki (10 from 2001-10), Michael Young (5 from 2003-07), Kirby Puckett (1986-89), Wade Boggs (7 from 1983-89), Charlie Gehringer (5 from 1933-37), Chuck Klein (5 from 1929-33), Bill Terry (1929-32), Al Simmons (5 from 1929- 33), Paul Waner (1927-30) and Jack Tobin (1920-23)...became the fourth right-handed hitter in MLB history to reach 200 hits in four straight seasons, joining Simmons, Puckett and Young...received an AL Player of the Month award (July) and an AL Player of the Week award (July 3-9)...also received the Lou Gehrig Memorial Award...led the AL in multi-hit games (59) and the Majors in games with at least three hits (23)...marked the most multi-hit games by an Astro since 2014, when he set a club record with 69...also marked the most games with at least three hits by an Astro since 2014, when he set a club record with 24...led the Majors in WAR (8.4, Baseball-Reference), topping Aaron Judge (8.1), Giancarlo Stanton (7.6) and Joey Votto (7.5)...in the AL, ranked first in infield hits (35), tied for second in runs (112), third in OBP (.410), third in stolen bases (32), third in OPS (.957), fifth in total bases (323), sixth in slugging (.547) and tied for ninth in doubles (39)...hit .346 with 32 steals and a .957 OPS...became the 14th player in Major League history to put up those numbers in a single season, joining Larry Walker (1997), Ellis Burks (1996), Paul Molitor (1987), Tony Gwynn (1987), Jackie Robinson (1949), Kiki Cuyler (1925, 1929-30), George Sisler (1920-22), Ty Cobb (1910-15, 1917), Tris Speaker (1912-13, 1916), Shoeless Joe Jackson (1911-12), Benny Kauff (1914), Sam Crawford (1911) and Honus Wagner (1908)...this was his sixth consecutive 30-steal season...is the only player in the Majors with 30 steals in each of the last six seasons...joins Cesar Cedeño (1972-77) as the only Astros with six consecutive 30-steal seasons...posted a .965 OPS as a second baseman, the highest by an AL second baseman since Chuck Knoblauch in 1996 (.971)...posted a batting average above .290 and an OPS above .850 in every month...ranked second in the AL in both batting average prior to the All-Star Break (.347) and batting average after the All-Star Break (.344)...posted a .441 (26x59) batting average in close and late situations, which led all Major League hitters and was the highest mark produced by a Major Leaguer since Yan Gomes hit .458 (27x59) in those situations in 2015...hit .381 (112x294) on the road, which led the Majors and was the highest mark by a Major Leaguer since Ichiro Suzuki hit .405 on the road in 2004...hit .421 (32x76) in Interleague play, which was the best mark in the Majors...has long been one of the best hitters in the Majors against southpaws, but this year led all Major League hitters in batting average against right-handed pitchers with a .344 (155x451) mark...received his fifth career All-Star nod, and third career fan-elected start at second base after finishing second among all AL players in votes with 3,880,372, behind only Aaron Judge (4,488,702)...became the second player in club history to start three straight All-Star Games, joining Craig Biggio (1995-98 at 2B)...his five All-Star nominations rank tied for second in club history with Lance Berkman, behind Craig Biggio (7)...became the 11th second baseman in AL history to start three All-Star Games, joining Roberto Alomar (9), Rod Carew (8), Nellie Fox (8), Charlie Gehringer (6), Joe Gordon (5), Bobby Doerr (5), Robinson Cano (5), Willie Randolph (4), Alfonso Soriano (3) and Lou Whitaker (3)...posted a .547 slugging percentage, the fifth-highest single-season mark by a player listed at 5-foot-6 or shorter in MLB history...ranked behind four separate seasons by Hack Wilson, set from 1927- 30...Wilson posted a .723 SLG in 1930...made his sixth consecutive Opening Day roster and avoided a stint on the Disabled List for the seventh consecutive season...began the year just 6x32 (.188) over his first eight games from April 3-10...had no extra-base hits, home runs or RBI in that span...ended up batting .326 (29x89) with three homers and an .874 OPS in 24 games during the month of April...stole the 200th base of his career on April 9 vs. KC...became the seventh player in club history with 200 career steals, and the first since Craig Biggio (414) and Jeff Bagwell (202)...reached base safely in 11 consecutive plate appearances from April 11-14, going 8x11 (.727) with four walks and three doubles over a three-game span...became the first Astros player to reach in 11 straight plate appearances since Bill Spiers set a franchise record by reaching in 13 straight plate appearances in 1997...did not play on April 26 at CLE, snapping a streak of 80 consecutive games where he started and hit third in the Astros lineup...that streak began on Aug. 19, 2016...left the game on April 25 at CLE in the 8th inning after suffering a collision with RF Teoscar Hernandez...posted a 17-game hitting streak at Angel Stadium that ran from June 22, 2015-May 7, 2017...was the fourth-longest hitting streak by a visiting player in the history of the venue...hit .414 (29x70) with a .447 OBP during his streak...went 4x5 with two doubles, two triples and an RBI on May 17 at MIA... set a single-game career-high for extra-base hits...became the first player in club history to hit two doubles and two triples in a single game, and the 12th player in MLB history to do so (first since Carl Crawford in 2005)...also became the third Major Leaguer since 1913 to record four extra-base hits in a game without scoring, joining Matt Murton (2006) and Willie Jones (1949)...went 8x14 (.571) during Houston's three-game series in Minnesota at Target Field (May 29-31), giving him hits in all 14 of his career games played at the venue...posted a 35-game road on-base streak from Sept. 9, 2016-June 19, 2017....was the second-longest streak of his career behind a 43-game run in 2016...hit .399 (55x138) with a .475 OBP during his streak...played the 900th game of his career on June 20 at OAK...only 31 players in MLB history recorded more hits within their first 900 games than Altuve (1,133)...his hit total was more than Ted Williams (1,117), Albert Pujols (1,114), Lou Gehrig (1,113) and Pete Rose (1,100) recorded within their first 900 games in MLB...named the AL Player of the Month for July after leading the Majors in batting (.485), hits (48), OBP (.523), OPS (1.251) and total bases (72)...recorded a hit in 21 of his 23 games in the month, including multiple hits in 16 games...posted the ninth-highest July batting average in Major League history, and the highest since Chipper Jones hit .500 in July of 2006...was the highest batting average by an Astros player in any month in club history...per Elias, was the fifth-highest batting average by a Major Leaguer in any calendar month since 1961, trailing Todd Helton (.512, May 2000), Ivan Rodriguez (.500, June 2004), George Brett (.494, July 1980) and Wade Boggs (.485, June 1987)...his 48 hits in July were tied for the second most in club history for a single July with Craig Biggio (1999), trailing only Rusty Staub's 49 hits in July of 1967...was named the AL Player of the Week for the week of July 3-9...was his third career weekly award, and second by an Astro in 2017...during the week, he hit .625 (15x24) with two doubles, two homers, 10 RBI, two steals and a 1.625 OPS in five games, leading the AL in batting, OBP and OPS...recorded three hits in five consecutive games from July 4-9, setting a franchise record for consecutive three-hit games...became the ninth player in Major League history to record at least three hits in five straight games, and the first since George Brett, who tied the Major League record with a six-game run in 1976...posted a .347 batting average prior to the All-Star Break...tied him for the fifth-highest batting average prior to the All-Star Break in club history with Lance Berkman (.347 in 2008), behind Berkman (.365 in 2001), Moises Alou (.362 in 2001), Cesar Cedeño (.355 in 1972) and Jeff Bagwell (.348 in 1994)...recorded consecutive four-hit games from July 23-24, tying a franchise record for most consecutive four-hit games...marked the third time in his career that he recorded back-to-back four-hit games...recorded a hit in eight consecutive at-bats during those games...had a club-high 19-game hitting streak from July 2-28...hit .524 (44x84) with 14 multi-hit games, 10 doubles, one triple, four homers, 19 RBI and a 1.370 OPS...was longest streak by an Astro since Hunter Pence's 23-game streak in 2011...doubled in five straight games from July 23-28, tying him for the second-longest doubles streak in club history, last accomplished by Ty Wigginton in 2008...hit six home runs in August, tying the most he has hit in any month of his career (also April of 2016)...hit his 24th homer on Sept. 19 vs. CWS, tying his career high set in 2016...batted .310 (22x71) with two doubles, seven homers, 14 RBI, two steals and a 1.021 OPS (.388 OBP/.634 SLG) in 18 postseason games...set a franchise record for hits in a single postseason with 22, surpassing Carlos Beltrán's record of 20 he set in 2004...marked the 2nd-most hits by a second baseman in a single postseason in MLB history, behind only Marty Barrett (1986)...set a MLB record for RBI as a second baseman in a single postseason with 14...his seven homers tied for the most by a second baseman in a single postseason with Daniel Murphy (2015)...tied the fourth-most homers in a single postseason in MLB history, regardless of position... hit six of his postseason at homers at Minute Maid Park...tied a MLB record for most home runs at home in a single postseason, tying Jayson Werth (2009)...tied a Major record for most three-hit games in a single postseason with four...joined Albert Pujols (2004), Edgar Martinez (1995) and Jay Buhner (1995)...hit three home runs in Game 1 of the ALDS vs. BOS...hit two of his homers off LHP Chris Sale...became the first player in club history with a threehomer game in the postseason, and the ninth player in MLB history to do so...joined Pablo Sandoval (2012 World Series Game 1), Albert Pujols (2011 World Series Game 3), Adrian Beltre (2011 ALDS Game 4), Adam Kennedy (2002 ALCS Game 5), George Brett (1978 ALCS Game 3), Reggie Jackson (1977 World Series Game 6), Bob Robertson (1971 NLCS Game 2) and Babe Ruth (1928 World Series Game 4, 1926 World Series Game 4)...hit backto-back homers off LHP Chris Sale with Alex Bregman in the 1st inning of Game 1 of the ALDS, making the Astros the fifth team in AL history to hit back-to-back HR in the 1st inning of a postseason game (first since Detroit in 2011)...became the first player in club history to record multiple hits in each of his first three games of a single postseason...hit a go-ahead solo homer to lead off the 10th inning of Game 2 of the World Series, homering off his former teammate RHP Josh Fields...was the 18th extra-innings homer in World Series history, and the first since David Freese's walkoff homer for the Cardinals in Game 6 of the 2011 World Series vs. TEX...became the 13th player in MLB history to post a game with three hits, four RBI and three runs scored in the World Series when he did so in Game 5...hit a game-tying, three run homer off Kenta Maeda. Was named to his fourth career All-Star Game, named the Sporting News Player of the Year, MLBPA Player's Choice Player of the Year and AL Most Outstanding Player, and won his third consecutive Silver Slugger Award in what was his sixth Major League season...with a .338 average and 216 hits, won the AL batting title and led the AL in hits for the second time in his career...also led the league with a .341 clip and 225 hits in 2014...became the first second baseman to win multiple batting titles since Rod Carew, who won five as a second baseman between 1969-75...became the first second baseman in Major League history to reach 100 runs, 200 hits, 40 doubles, 20 HR, 95 RBI and 30stolen basesin one season...became just the sixth player in Major League history overall with this distinction (source: Elias)...his combined 204 runs scored and RBI accounted for 28 percent of the Astros 724 runs scored overall in 2016...ranked in the top five in the AL in several categories: batting average (1st, .338); hits (1st, 216); four-hit games: (1st, 8); three-hit games; (T-1st, 23); steals (T-2nd, 30); WAR (3rd, 7.7); doubles (T-3rd, 42); total bases (4th, 340); OBP (4th, .396); OPS (5th, .928)...his 340 total bases were tied for eighth all-time in a season for an AL second baseman (50% of games at the position)...216 hits were also seventh all-time for an AL second baseman...led all AL second basemen in batting, hits, OBP, WAR, total bases and OPS while ranking second in slugging (.531)...was the Houston Chapter BBWAA Astros MVP...was the Astros nominee for the 2016 Hank Aaron Award which has recognized the most outstanding offensive performer in each league since it was established in 1999...reached career highs in HR, RBI, slugging, total bases and OPS while maintaining his low strikeout rate (10.24 strikeouts per PA, 2nd in the AL)...batted .376 on the road, which was tops in the Majors and the highest of any hitter since Ichiro Suzuki hit .405 on the road in 2004...posted a .991 road OPS...was named AL Player of the Month in June after hitting .420 (42x100) with six doubles, 4 HR, 15 RBI, six steals and a 1.112 OPS (.492 OBP/.620 SLG) in 26 games...led all AL players in batting average, establishing a franchise record for the month of June (min. 75PA)...started his second consecutive All-Star Game at second base in what was his fourth All-Star appearance overall (also 2012, 2014, 2015)...became just the second player in club history to start consecutive All-Star games, joining Craig Biggio, who started four consecutive games at second base from 1995-98...his four All-Star nods are tied for the third-most in club history with Jeff Bagwell (4) and Cesar Cedeno (4), behind only Craig Biggio (7) and Lance Berkman (5)...was a clutch performer, hitting .372 with a 1.042 OPS with runners in scoring position, and .327 with a .971 OPS with RISP and two outs...batted .341 prior to the All-Star Break and .333 after the Break...his batting average did not drop below .330 after June 5...played in 161 of the club's 162 games...reached 200 hits for the third straight season, becoming the first player to do so since Ichiro Suzuki (2001-10)...prior to 2016, the last right-handed hitters with as many or more consecutive 200-hit seasons were Michael Young (2003-07) and Derek Jeter (2005-07)...he and shortstop Carlos Correa each had 96 RBI, becoming the first AL middle infield combo to reach 95 or more RBI in the same season since 1950, when Red Sox SS Bobby Doerr (120) and 2B Vern Stephens (144) turned the trick...became the second player in MLB history listed at 5-foot-6 or shorter with a 24-homer season, along with Hall of Famer Hack Wilson, who did so four times, most recently in 1930 (56HR)...his eight games with four-or-more hits were the most in franchise history for a single season...the last Major Leaguer with at least eight games with four-or-more hits was Ichiro Suzuki in 2004...became the first Astros player with 20 HR 64 2017 HOUSTON ASTROS and 20 stolen bases in the same season since Carlos Beltran in 2004 (23 HR, 28 SB)...had 96 RBI (tied for the club lead), with 86 coming as a second baseman...marked the most RBI by an Astros second baseman since Jeff Kent set the club record in 2004 with 106...became the second player in club history to record 40 doubles in three straight seasons: also Craig Biggio (2003-05)...became one of three second basemen in ML history to have a year with 40 doubles, 100 runs, 24 HR and 27 steals: also Alfonso Soriano (2002, 2005) and Roberto Alomar (1999)... reached 1,000 hits for his career in his 786th career game...became the quickest player in franchise history to reach 1,000 career hits, and the second-quickest among then-active Major League players behind Ichiro Suzuki (696 games)...surpassed Cesar Cedeno (889 games) for the club record...made his fifth consecutive Opening Day roster and start, and remained with the club for the duration of the season...missed four games from June 18-21 with discomfort in his right hamstring, but was not placed on the Disabled List...named the AL Co-Player of the Week on April 8, along with Baltimore's Mark Trumbo...was his second career Player of the Week award...hit .407 (11x27) with eight runs, three doubles, three HR, seven RBI, two steals and a 1.336 OPS (.484 OBP/.852 SLG) in seven games...led the AL in OPS in that span...became the first player in Major League history to reach 11 doubles and nine stolen bases in April in a single season...prior to 2016, the last Major League player to reach both marks in any month was also Altuve (11 2B, 9 SB) in May of 2014...prior to Altuve, the last player to reach both marks in a single month was 2B Jason Kipnis (12 2B, 9 SB) in June 2013...became the first Astros player to record three leadoff home runs in April of a single season...his 17 extra-base hits were the second-highest total in a single month in his career, trailing only his 2015 September (19 extra-base hits)...had two season-long 12 games hitting streaks...his first was May 8-20, batting (.408, 20x49)...the second spanned from May 26-June 6, batting .429 (21x49)...had a season-long four-game hitless streak between the two, 12-game runs...became the second player in MLB history with six leadoff HR before June of a single season, joining Brady Anderson (7 in 1996 for BAL)...on June 9, made his first-career appearance at a position on the field other than second base, as he moved to shortstop when Correa left the game with a left ankle sprain...received two chances at shortstop and recorded two assists...had a 32-game on-base streak from May 26-June 29, which was the longest of his career (previously 29 games from 8/1-9/1/15)...during the streak, he hit .424 (53x125) with a .483 OBP...was the longest streak by an Astro since Lance Berkman reached safely in 37 consecutive games from July 30-Sept. 8, 2004...went 0x2 with two sac-bunts and an intentional walk on July 10 vs. OAK...was his first-career game with multiple sac-hits...joined Roger Metzger (July 23, 1972 vs. CHC) as the only players in club history to record an IBB and two SH in the same game...was just the sixth time since 1913 that a player had a game like this with the DH rule in effect (last, Jose Valentin for CWS on July 5, 2000 at KC)...his 119 hits were the third-most in club history prior to the All-Star Break of a single season...trailed only Bob Watson (123 hits in 1973) and his own club record of 130 hits he set in 2014... recorded 12 hits from July 17-20...per Elias, marked the most hits in a four-game span for an Astros player since Lance Berkman (13 in 2008)...posted a career-high six RBI in what was his second career multi-HR game on July 24 vs. LAA...per Elias, the only other second baseman in club history to record two HR and six RBI in a single game was Craig Biggio on Aug. 23, 1998 vs. CHC...became the first Astros player with six RBI in a game since Chris Johnson on May 2, 2012 vs. NYM...had a 21-game road hitting streak from June 8-July 30 (.512, 43x84, 6 2B, 2 3B, 14 RBI, 1.291 OPS)...tied for the third-longest road hitting streak in club history, behind only Cesar Cedeno (26g from 1975-76) and Lance Berkman (23g in 2008)...had a 43-game road on-base streak from April 30 at OAK to Aug. 14 at TOR...batted .482 (82x170) with 10 doubles, four triples, five HR, 32 RBI and a 1.212 OPS (.536 OBP/.676 SLG) during the streak, which was the longest by a Major Leaguer since Edwin Encarnacion reached in 46 straight road games in 2015...was third-longest streak in club history, behind two separate streaks by Jeff Bagwell (52g from 1998-99; 43g in 1998)...reached 200 career doubles on Aug. 5 at CLE in what was his 804th career game...reached the 200-double mark in the fewest amount of games in club history (previously Lance Berkman, 811 games)...had a 19-game hitting streak vs. LAA (Sept. 11, 2015- Sept. 22, 2016) in which he hit .487 (38x78) with seven doubles, two triples, four homers, 13 RBI and a 1.300 OPS...the last player with a 19-game streak vs. the Angels was Hank Blalock (2007-08). Was named to his third career All-Star Game, his ﬁrst start, won his second consecutive Silver Slugger, earned his ﬁrst career Gold Glove and was given the inaugural Majestic Always Game Award, a Players Choice Award voted on by the MLBPA...led the American League in hits (200) and steals (38) for the second consecutive season, joining NYY's Snuﬀy Stirnweiss (1944-45) as the only players in Major League history to lead the American League in both hits and steals in back-to-back seasons...became the ﬁrst player in club history to reach 200 hits in consecutive seasons, as he led the Majors with a franchise-record 225 hits in 2014...the only other player in club history to record a 200-hit season was Craig Biggio in 1998 (210 hits)...was the only Major Leaguer to reach 40 doubles, 15 homers and 35 stolen bases this season, and the ﬁrst to do so since Jacoby Ellsbury in 2011...the only other player in club history to reach these marks in a single year: Craig Biggio in 1998...started his ﬁrst career All-Star Game at second base in what was his third All-Star appearance overall (also 2012, 2014)...became the seventh player in club history to earn a fan-elected start (10th time overall), and the ﬁrst to do so since Lance Berkman in 2008...joined 2015 Hall of Fame inductee Craig Biggio (1995-98) and Jeﬀ Kent (2004) as the only Houston second basemen to earn a fan elected start...led the AL in three-hit games (21), and ranked third in batting average...led all Major League second basemen in ﬁelding percentage (.993, 5E/669TC), closing out his season with 51 consecutive errorless games...became the ﬁrst player in club history to record four consecutive 30-double, 30-steal campaigns...became the 20th player in club history to reach 800 hits, and became just the fourth player in Major League history to record 800 hits, 150 doubles and 150 steals through his ﬁrst ﬁve seasons in the big leagues...joined Ray Durham (1995-99), Ben Chapman (1930-34) and Del Pratt (1912-16)...his 830 career hits through his ﬁrst ﬁve Major League seasons are a franchise record (previously Cesar Cedeno: 782 from 1970-74)...set career highs in home runs (15) and RBI (66)...joined Michael Bourn (2008-11), Jose Cruz (1977-80), Cesar Cedeno (1972-77) and Enos Cabell (1976-79) as the only players in club history with 30-or-more steals in four consecutive seasons...had three walk-oﬀ hits for Houston, which led the club...hit .372 (70x188) vs. left-handed pitchers, which led the Majors for the second consecutive season...became the only player since 1974 (the year left/right splits were ﬁrst tracked) to lead the Majors in batting average against lefties in consecutive seasons...his .353 (258x730) career average against southpaws is the best since 1974 (min. 750 PA), ahead of Freddy Sanchez (.342,292x854) who played from 2002-11...batted .337 (102x303) with an .884 OPS (.372 OBP/.512 SLG) following the All-Star Break...over his last 26 games of the season, slugged .625 while compiling 23 extra-base hits (16 doubles, 3 triples, 4 homers)...made his fourth consecutive Opening Day roster and start, and remained with the club for the duration of the season...missed four games from June 18-21 with discomfort in his right hamstring, but was not placed on the Disabled List...tied a club record by recording 39 hits through the team's ﬁrst 25 games...Billy Hatcher also reached this mark through the 25th game of the 1987 season...posted a 29-game hitting streak against the A's from Sept. 5, 2013-April 26, 2015...marked the second-longest hitting streak against Oakland in Major League history, behind Luke Appling's 31-game streak from1939-40...recorded multiple hits in nine straight games from April 22-May 1, which tied a franchise record set by Jesus Alou (1969) and Billy Hatcher (1987)...was named the American League Co-Player of the Week along with Oakland's Josh Reddick for the week ending May 3...hit .467 (14x30) with seven runs, ﬁve doubles, one homer, eight RBI, two steals and a 1.233 OPS in the week...was the only Major Leaguer in 2015 to have a game with multiple steals and multiple doubles, which he accomplished on June 25 vs. NYY...his two career multi-double, multi-steal games are tied for the most in franchise history with Cesar Cedeno and Derek Bell...hit his ﬁrst career walk-oﬀ homer on July 23 vs. BOS, tallying a career-high tying four hits in the contest...per Elias, became the third Astros player in club history to start a game in the leadoﬀ spot and then hit a walk-oﬀ home run, joining Craig Biggio (1998 and 2001) and Jimmy Wynn (1973)...hit in 18 consecutive games at Minute Maid Park from June 4-July 29, marking the longest hitting streak recorded at the venue by an Astro all-time...was the longest home-hitting streak by an Astros player since Derek Bell hit in 21 straight games at the Astrodome in 1998...posted a 20-game hitting streak at O.co Coliseum from Sept. 5, 2013-Aug.9, 2015...tied him for the third-longest streak in stadium history with Erick Aybar (2012-15), behind only Paul O'Neill's 21-game run from 1995-98 and Carney Lansford's 30-game streak in 1984 (Elias)...recorded 26 consecutive singles from July 29-Aug. 18...marked the longest streak by an Astro since Roy Oswalt recorded 31 consecutive singles without an extra-base hit from 2007-10...the last position player with a streak like this was Willy Taveras in 2005...reached base safely in every game during the month of August while leading the Majors with 45 hits...tied the club record for most hits in a single August with Jesus Alou (1970)...had a career-long, 29-game on-base streak from Aug. 1-Sept. 1, which was the longest by an Astros player since Willy Taveras (31g) in 2006...tallied his 800th career hit on Sept. 11 at LAA in what was his 647th career game...became the quickest player in club history to reach the 800-hit plateau: previously Cesar Cedeno (707games)...made his ﬁrst career postseason appearance, starting at second base and batting leadoﬀ in all six of Houston's playoﬀ games...tied a club record for most hits within a player's ﬁrst two postseason games (4)... joined Kevin Bass, who recorded four hits in the 1986 NLCS against the Mets...went 4x26 with two RBI and a steal in the postseason. Had one of the greatest seasons in franchise history, setting a club record with 225 hits while leading the Majors in hits and batting average in his age 24 season...surpassed IF Craig Biggio (210 hits in 1998) for the Astros single season hits record, while also joining Biggio as the only players in club history to have a 200-hit season...posted single-season franchise records with 69 multi-hit games, 24 three-hit games and 168 singles (all tops in MLB in 2014)...won a Louisville Slugger Silver Slugger Award as the American League's top offensive second baseman...joined IF Craig Biggio as the the only second basemen in Astros history to win the award...became the 10th player in club history to win a Silver Slugger...became just the second player in Major League history to compile 225 hits, 47 doubles and 56 steals in a single season, joining OF Ty Cobb, who did so in 1911 (248 hits, 47 doubles, 83 steals)...became the first player in franchise history to win a batting title...prior to his historic season, the Astros were one of four teams in the Majors to never have a player win a batting title (also Milwaukee, Arizona and Tampa Bay)...joined C Joe Mauer (2006) and IF Alex Rodriguez (1996) as the only AL players age 24-or-younger to win a batting title in the last 20 seasons...his 225 hits were the most by a second baseman in a single season since IF Charlie Gehringer posted 227 hits in 1936 for Detroit...marked the most hits by a right-handed hitter since Paul Molitor also had 225 hits in 1996...received his second career All-Star nomination after getting voted to the American League All-Star team via the player vote...is one of three Astros second basemen to make an All-Star team (also IF Joe Morgan and IF Craig Biggio)...set the single-season record for hits by a Venezuelan-born player, passing OF Magglio Ordonez, who set the previous record with 216 hits in 2007...his 56 steals tied as the third-most by a Venezuelan..finished the season leading the AL in batting average, hits and stolen bases, becoming the first player to lead his league in those categories since OF Ichiro Suzuki in 2001 (.350, 242 hits, 56 steals)...prior to Suzuki, the last player to do so was IF Snuffy Stirnweiss with the 1945 Yankees (per Elias)...became the first Astros player to lead his league in stolen bases (56) since OF Michael Bourn in 2010 (52)...led the Majors with a .414 (63x152) average vs. left-handed pitchers...ranked as the second-highest mark in club history for a single season, behind IF Jeff Bagwell's .457 average vs. lefties in 1994...was the second-toughest player to strike out in the Majors as his strikeout rate of 7.5% (53SO/707PA) ranked behind only DH Victor Martinez (6.6%)...among all MLB hitters, put the highest percentage of pitches into play (27.9%) while posting the fifth-lowest percentage of swings that missed (9.9%)...saw the fewest number of pitches per plate appearance (3.10) among all Major League hitters...was the lowest pitches per plate appearance mark by an MLB player since IF Robinson Cano in 2005 (3.05)...tallied 130 hits prior to the All-Star Break, which marked a new Astros record...IF Bob Watson held the previous mark with 123 hits prior to the 1973 All-Star Break...Altuve set the club record with 88 first half games, while Watson did so in 102 games...Altuve's 41 steals in the first half ranked second in franchise history after OF Gerald Young's 47 steals which he recorded during the first half in 1988...per Elias, set a franchise record by going errorless in 88 straight games from Aug. 17, 2013-May 27, 2014...the previous record was held by IF Rafael Landestoy (78g in 1980)...from June 26-29, 2014, became the first Major League player in 97 years to have four straight multi-steal games...became just the third player in baseball's modern era (since 1900) to do this: also IF Ray Chapman (1917) and IF Bill Dahlen (1904)...tied a franchise record with 28 consecutive successful stolen base attempts from May 17-July 19, 2014...tied a franchise record set by OF Carlos Beltran in 2004...on June 18, 2014 at WSH, recorded his 500th career hit with a 9th-inning single...marked his 426th career game, making him the fastest player to reach 500 career hits with the Astros franchise...OF Cesar Cedeno set the previous record in 1973, as he needed 427 career games to reach 500 hits...with three hits in the Astros 3-1 win on June 20 at TB, became the first Major Leaguer to reach 100 hits on the season...reached 100 hits with his second hit of the night, in his 298th at-bat, becoming the first Astros player to reach 100 hits before his 300th at-bat of a season since 2008, when IF/OF Lance Berkman got to the century mark in his 277th at-bat...set a club record by recording a steal in seven straight games from June 24-30, 2014... banged out two hits, scored two runs and stole two bases in the Astros 6-1 win on June 26 vs. ATL...by reaching the 30-steal mark that game, became the fourth player in Astros history with at least 100 hits and 30 stolen bases before the All-Star break in one season...the other Astros to do it were OF Cesar Cedeno in 1974 (112 hits, 36 steals), OF Billy Hatcher in 1987 (101, 33) and OF Michael Bourn in 2011 (104, 35)...went 3x5 with two stolen bases on June 30 vs. DET, giving him a four-game streak with multiple hits and stolen bases...no other player in baseball's modern era (1900 to date) has had a four-game streak with at least two hits and two steals in each game...finished the month of June with a .411 batting average and 17 stolen bases...marked the most stolen bases for any Major League player who batted .400 or better in a month since July of 1992, when OF Brett Butler, then with the Dodgers, batted .442 with 18 stolen bases...OF Rickey Henderson batted .416 with 22 steals for the Yankees in June of 1985, but before Butler and Henderson, the last to do it was OF Ty Cobb, who batted .430 with 20 steals in September of 1911 (Elias)...became the first player in the All-Star era (since 1933) to record 130 hits and 40 steals before the All-Star Break...hit .335 in the first half, finishing two points behind IF Adrian Beltre (.337) for the first half batting title...entered the 2014 All-Star Game in the 5th inning at second base and ultimately drove in IF Alexei Ramirez on a sacrifice fly to deep left field in his only plate appearance...became just the fifth Astros player ever to record an RBI in an All-Star Game...also IF/OF Lance Berkman (2002, 2006, 2008), IF Craig Biggio (1995-96), OF Cesar Cedeno (1973, 1976), IF Lee May (1972)...tied a career high with four hits and hit his first career grand slam on Aug. 18 at BOS...was the only grand slam hit by an opposing player at Fenway Park during the season...became the first Astros player to record four hits and a grand slam in the same game since IF Jeff Bagwell did so on April 9, 2004, at MIL...from Aug. 30-Sept. 2, recorded back-to-back four hit games, becoming the first Astro to do so since IF/OF Lance Berkman in 2008...recorded hits in six straight at-bats over that stretch, the most by an Astro since OF Brandon Barnes in 2013...extended his hitting streak against the Athletics to 23 games with a 1x4 performance on Sept. 7 at OAK...marks the longest hitting streak any Astros player has had against any one team in the history of the franchise...IF/OF Lance Berkman held the previous record with a 21-game hitting streak against the Rockies from 2004 to 2008... from Sept. 10-17, recorded multiple hits in seven straight games...marked the longest multi-hit game streak by an Astro since IF/OF Lance Berkman also went seven straight from May 3-10, 2008...only two Astros in club history had multi-hit game streaks longer than seven games: OF Billy Hatcher (9g, April 12-21, 1987) and OF Jesus Alou (9g, Sept. 1-11, 1969)...posted a career-long, 14-game hitting streak from Aug.23-Sept. 7...was the Astros longest hitting streak of the season...entering the final game of the season (Sept. 28 at NYM), held a .003 point advantage over the Tigers DH Victor Martinez for the AL batting title... went 2x4 on the day to secure the title with a .341 (225x660) average, directly ahead of Martinez' .335 (188x561) mark...named the Astros Team MVP by the Houston Chapter of the BBWAA...was the Astros nominee for Major League Baseball's Hank Aaron Award...also named the Astros recipient of the Heart and Hustle Award, presented by the MLB Players Alumni Association...additionally, was named one of three finalists as the AL's Most Outstanding Player in the Players Choice Awards. Set career highs in hits, RBI and steals in what was his second full season (3rd overall) in the Majors... led the Astros in hits and steals, and ranked tied for first in runs (64) and games played (152)...made his second consecutive Opening Day start ... ranked sixth in the American League with 35 stolen bases and fourth in multi-steal games (5)...was one of three Major Leaguers (also Leonys Martin and Rajai Davis) to have two games with three-or-more stolen bases...had the most steals by an Astros second baseman since Craig Biggio swiped 50 in 1998...led Major League second basemen in steals and double plays turned (114) ... among AL second basemen, finished third in hits and fifth in both batting average and fielding percentage (.987)... became the fifth player in Astros history to record 30+ doubles and 30+ stolen bases in back-to-back years, joining Craig Biggio (1997-98, 1994-95), Enos Cabell (1977-79), Cesar Cedeno (1972-73) and Jose Cruz (1977-79) ... led the AL with a .376 OBP when batting leadoff (min. 125 plate apps. )...reached base safely in 126 of his 152 total games (83%)...his 35 hits in April set a franchise record for a scond baseman and ranked fifth all time for any player in Astros history ... eclipsed 400 hits for his career on Sept. 24 at TEX in what was his 352nd career game...was the third fastest Astro to reach the 400-hit mark behind Cesar Cedeno (342g) and Hunter Pence (348g) ... needed the second-fewest games in Astros history to reach 75 doubles and 75 steals to start his career...did so on Sept. 25 at TEX in what was his 353rd career game...the record is held by Cesar Cedeno (344 games)...recorded an RBI in four straight games from Aug. 6-10 and became the first Astros second baseman to do so since Craig Biggio in July of 2005 (7/4-7)...his 41 hits in September ranked as the third highest total in franchise history, trailing only Richard Hidalgo's 49 hits in Sept. of 2000 and Cesar Cedeno's 47 hits in 1977...led the Majors in hits and led the AL in batting average (.357) during the month...since his MLB debut on July 20, 2011, his 405 hits are more than any MLB second baseman except Robinson Cano (467) and Dustin Pedroia (443)...ranks second among MLB second basemen in steals during that span (75) behind Emilio Bonifacio (80)...missed three games while on the Bereavement List (May 14-17)...named the Astros nominee for the 2013 Roberto Clemente Award...on July 13, 2013, signed a four-year contract extension that runs from 2014-17...the deal also includes club option years for the 2018-19 seasons. The 2012 first-time All-Star posted a .340 OBP, tallying 40 walks in 147 games (drew just five walks in57 games in 2011)...led the club with 45 extra-base hits...also led the club in runs, hits, doubles, triples andstolen bases in what was his first full season in the Majors...finished the season ranked fifth in the Majorswith a .359 (56x156) batting average vs. LHP (min. 155 AB)...ranked seventh in the NL with 33 steals...his51 multi-hit games ranked tied for ninth in the NL...ranked fifth in the NL in fewest percentage of swingsthat miss (10.6%)...ranked fourth in batting average against NL Central opponents with a .321 (87x271) mark(min. 200 PA)...played the entire season with the Astros, made his first career Opening Day start, and led theclub with 147 games played, including 142 starts at second base...among NL second basemen, ranked firstin stolen bases, second in hits and third in batting average...became just the fourth Astros second basemanin franchise history to steal 30 bases in one season, also Biggio (5x), Doran (2x) and Morgan (3x)...was alsojust the eighth Astros player to steal 30 bases and hit 30 doubles in one season, also Bagwell (2x), Biggio(5x), Cabell (3x), Cedeno (5x), Cruz (3x), Thon, Wynn...according to Elias, became the first Astro with 36 hitsthru the club's first 25 games since Craig Biggio also did so in 2004...stole home and homered on June 10 atCWS, becoming the first Astros player to accomplish this in the same game since Jeff Bagwell on June 22,1993 at LAD...was named the Astros' recipient of the MLB Players Alumni Association's annual Heart andHustle Award...also named the Astros' 2012 MVP by the Houston Chapter of the Baseball Writers' Associationof America...played for Navegantes del Magallanes in the Venezuelan Winter League during the 2012offseason...hit .336 (48x143) with 10 doubles, 16 walks, eight steals and an .847 OPS (.406 OBP/.441 SLG)in 35 games with the club. Had 200 hits combined at the Major League (61) and minor league (139) levels in 578 combined at-bats in 2011...amongall NL rookies, ranked fourth in batting average after July 20 (.276)...had seven games with three hits at the Major League level...hit .327 (36x110) with six RBI in his first 28 games with HOU...his 51 starts at 2B as a rookie ranked fifth all-time by an Astrosrookie 2nd baseman and the most since Bill Doran in 1983 (151 starts)...named the Astros 2011 Minor League Player of the Yearafter leading all minor league players with a .389 (139x357) avg. at Double A Corpus Christi (.361 in 35g) and Class A Lancaster(.408 in 52g)...started at 2nd base for the World Team and went 2x3 with a double in the 2011 All-Star Futures Game...hadcontract purchased from Double A on July 19 and made his big league debut on July 20 by starting at 2B...singled in his fifthcareer MLB at-bat...his first career MLB home run was a leadoff, inside-the-park HR on Aug. 20 vs. SF (Bumgarner), making himthe first player whose first ML HR was to leadoff a game and an inside-the-parker since Hall of Famer Rich "Whitey" Ashburn didso on May 29, 1948...the last Astro to hit an inside-the-park HR for their first ML HR was LHP Butch Henry (May 8, 1992 at PIT),and the last Astro to lead off a game with an inside-the-parker was Bill Doran (April 22, 1987 vs. ATL) (Elias)...tied the franchiserecord by hitting safely in his first seven ML games (.423, 11x26), which was set by IF Russ Johnson in 1997 (.321, 9x28)...hit .423(11x26) in his first seven games...only two other players in HOU history collected 11-or-more hits in their first seven games in theMajors: Ken Caminiti in 1987 (11x27) and Orlando Miller in 1994 (11x23) (Elias)...following the season, played for Magallanes inthe Venezuelan Winter League and finished first in the league in hits (82) and third in batting average (.339). Made his professional debut in the Venezuelan Summer League and led the club in batting average (.343)and OBP (.429). August 21, 2018 Houston Astros activated 2B Jose Altuve from the 10-day injured list. August 19, 2018 Houston Astros sent 2B Jose Altuve on a rehab assignment to Fresno Grizzlies. 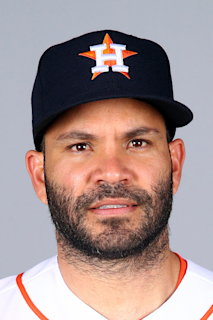 May 18, 2013 Houston Astros activated 2B Jose Altuve from the bereavement list. May 14, 2013 Houston Astros placed 2B Jose Altuve on the bereavement list. November 5, 2012 2B Jose Altuve assigned to Navegantes del Magallanes. November 5, 2012 Jose Altuve roster status changed by Navegantes del Magallanes. July 19, 2011 Houston Astros selected the contract of 2B Jose Altuve from Corpus Christi Hooks. June 1, 2011 Jose Altuve assigned to Corpus Christi Hooks from Lancaster JetHawks. November 2, 2010 2B Jose Altuve assigned to Navegantes del Magallanes. July 31, 2010 Jose Altuve assigned to Lancaster JetHawks from Lexington Legends. April 6, 2010 Jose Altuve assigned to Lexington Legends from Tri-City ValleyCats. August 11, 2009 Jose Altuve assigned to Tri-City ValleyCats from Greeneville Astros.